Maison Blanche Paint Company’s Satin and Matte Varnishes are water based Varnishes that dry to a durable finish and are ideal for furniture finishing. Our Satin and Matte Varnishes are specially formulated to finish surfaces painted with Maison Blanche Furniture Paint, Translucide Furniture Glaze, Latex, and water based paints. When fully cured, Satin and Matte Varnishes act as a barrier against dirt and allows stains to be removed with soap and water. Application: Allow your painted surface to dry for 24-48 hours prior to applying Satin Varnish. Your surface should be clean, dry and fully cured prior to application. 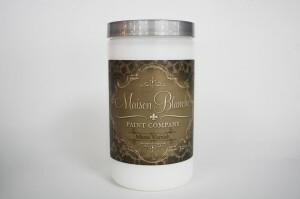 Maison Blanche Paint Company’s Satin Varnish can be brushed, rolled, or spray applied. Stir thoroughly before use, do not shake. For best results and maximum protection, it is recommended to apply a minimum of two coats. Dry-to-touch time is approximately 1⁄2 hour. Recoat time is approximately 2 hours. Lower temperature and high humidity will lengthen the dry and cure times. Do not store or apply at temperatures below 55 degrees F. Do not apply directly on top of a waxed surface.